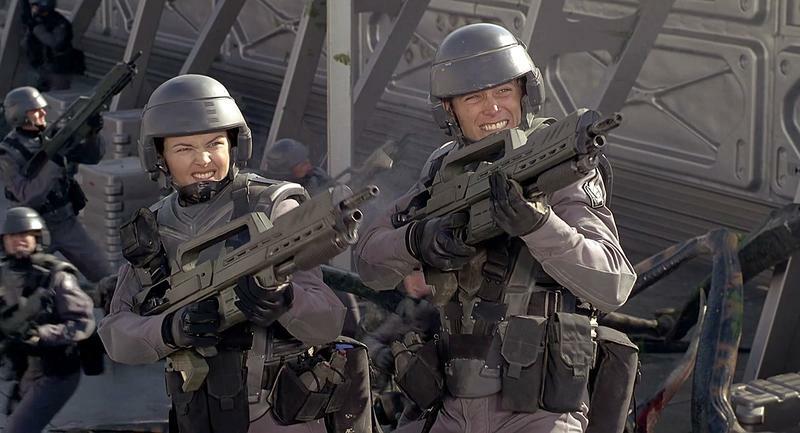 Starship Troopers, Hollywood's quintessential B-movie, is getting a reboot from Columbia Pictures, nearly 20 years after the original hit theaters. The hope, apparently, is to reach a new fanbase and build a universe that can be expanded upon. Because everything needs a grand, never-ending universe. Based on the sci-fi war novel by Robert A. Heinlein, Starship Troopers was told through the eyes of Johnny Rico as he moved up through the military ranks. Only, he wasn't fighting a war against another country—he was fighting for mankind's survival against alien bugs. People loved it for its cheesy action and one-liners. Deeper than that, director Paul Verhoeven crafted a satirical image of fascism, militarism, and propaganda films that often accompany major wars. Since its release in 1997, Starship Troopers has gone on to become a cult classic, and although there have been sequels, none have achieved the cultural success of the original. Hollywood Reporter says the original film isn't being rebooted. Instead, executives want to go back to the original Heinlein novel and craft a story from there. Unfortunately, that means actors from the 1997 film, including Casper Van Dien, won't be involved. To see what makes Starship Troopers so great, check out the clip above. "Come on, you apes. Do you want to live forever?"